Yesterday, I visited Expo Veldhoven 2014. I arrived there so early that I was the second visitor to enter the hall! I had a very good time at the show, but I didn't take many photos as I was too busy chatting with old friends and also making new ones. Anyway, here are a few pictures among my favorites. The first one is "Dutch Colors" by Willy Doreleijers. 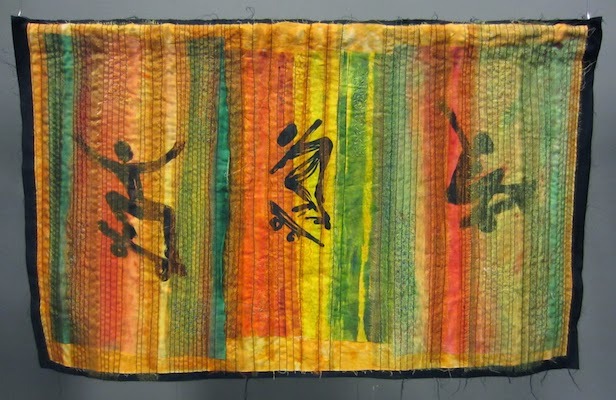 Next is "Skateboarders", a collaborative work by Susan Chapman, Christine Restall, Janet McCallum and Beverley Wood, from the group By Design. Please read about their working process on their website. 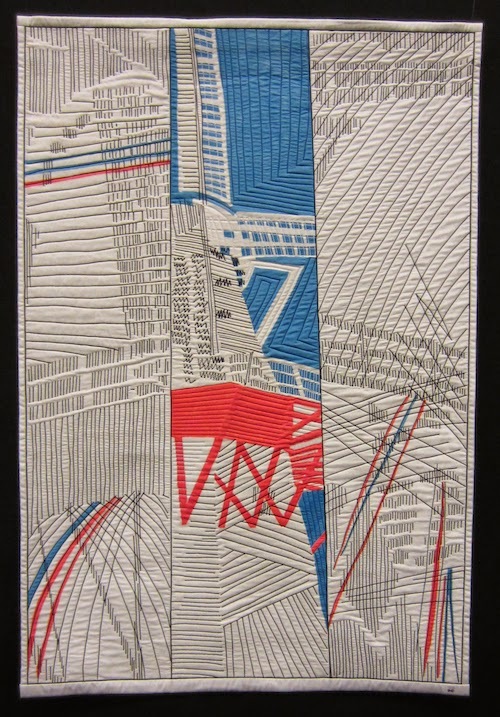 The next quilt is "Insieme" by Elisabeth Nacenta de la Croix. I think it was the first time I had the opportunity to speak four different languages in such a short time span, and I must say I had some trouble falling asleep after this! Wow, what a fantastic visit, I love your pics, especially the first quilt, it's stunning. 4 different languages! I have trouble mastering just one besides my own. 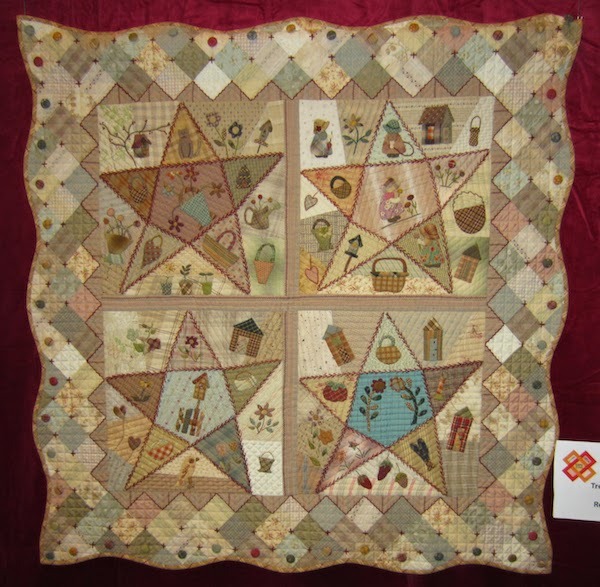 Very interesting quilts. How large/small were they? I enjoyed all the quilts you shared and thank you for the links too. It is lovely to meet up with friends and like-minded people and have a good chat. Nice selection, especially the first 1. I love this work by Willy Doreleijets, I just visited her website, and it's all so interesting. Thanks for sharing it with us. Thanks for sharing the photo’s Françoise! 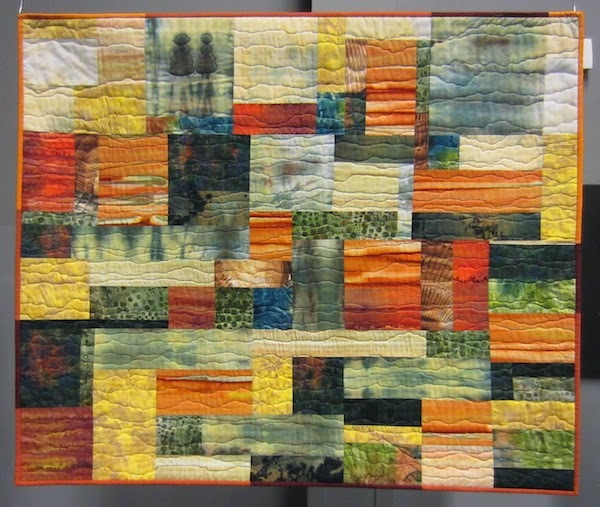 Love the Dutch colors quilt!